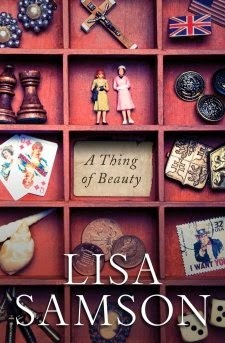 I assumed Lisa Samson’s AThing of Beauty would be the typical boy meets girls story. As such, I nearly passed up the opportunity to review the book. Something in the description of Fiona Hume, a child star who left Hollywood after rehab to build a safe place for herself surrounded by beauty, piqued my interest. Fiona is gritty, broken, opinionated, quirky and determined. I loved cheering for her happiness. This is a story of love, forgiveness and redemption. I was pleasantly surprised to find A Thing of Beauty a page turner. I delighted in reading along as Fiona's relationships deepened, her wounds healed and she began to learn how to receive love. "Could it be so simple as recognizing the beauty in the other's giving?" I found this glimpse into a hoarder's mindset illuminating. "My heart years a little. Not for a relationship, which surprises me, but just for beauty, even small, winking shards of the stuff, for beauty all around." This is my introduction to Lisa Samson; I will look for more of her work. This was a fun, easy and yet intriguing read. I'd love a sequel. There are enough unresolved threads in this story to keep me pondering. Good read. Pick up a copy when it releases 13 January 2015. I will go look at the library for this one. I've read a few of hers already & mostly liked them though they weren't often what I was expecting.